Turkish President Tayyip Erdoğan said that volatility in the dollar would decrease and that, when it comes to exchange and interest rates, domestic banks would lend support, local broadcasters quoted him as saying on Wednesday. 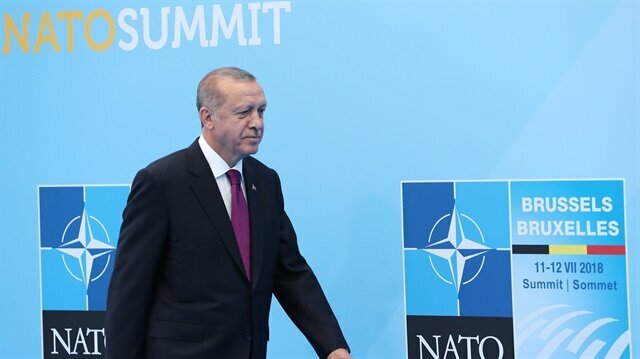 Erdoğan made the comments to reporters traveling on his plane to a NATO summit in Brussels, according to CNN Turk and other broadcasters. He also defended his choice of his son-in-law Berat Albayrak as finance and treasury minister, saying Albayrak had theoretical and practical experience in finance. Turkish President Recep Tayyip Erdoğan and his U.S. counterpart Donald Trump had a brief chat during the NATO summit that kicked off on Wednesday.Trump gawked as he watched two of Turkey’s domestically-produced T-129 Attack Helicopter take to the skies during an airshow. Twenty-five helicopters from 13 allies participated in the performance. Following the show, Erdoğan and NATO Secretary Gen. Jens Stoltenberg had a warm conversation as they entered the headquarters.Video: Turkish ATAK helicopter air show display stuns world leaders at NATO summitLeaders were invited to the official welcoming ceremony, and given a tour of the agora at the NATO headquarters in Brussels by Stoltenberg.After the ceremony, 29 NATO heads of state and government also visited an exhibition on the organization’s history and its activities along with Stoltenberg.Erdoğan is expected to hold bilateral meetings with his counterparts on the summit's sidelines.Video: Erdoğan meets Trump at NATO summitThe summit is set to review steps to adapt NATO to current security threats, as well as exchange views on threats to Euro-Atlantic security.Matters pertaining to ongoing tension between the EU and the U.S., moving the U.S. embassy to Jerusalem, Iran and climate agreements are expected to be discussed at the summit.Additionally, in a session held with the attendance of Georgia and Ukraine’s heads of state, improving relations between NATO and those countries will be discussed.Video: Turkish FM Çavuşoğlu attends NATO Engages 2018 in BrusselsThe alliance is also expected to affirm its support to Afghanistan. The summit will also affirm NATO’s “open-door policy” in the Euro-Atlantic region for peace and stability.The summit will additionally discuss six major topics -- including strengthening deterrence and defense, counter-terrorism and stability, strengthening cooperation with the EU, modernization of NATO, sharing of responsibility and common values, and the transatlantic union. Turkey's army may come under the authority of the defence ministry, Erdoğan said. Erdoğan on Monday appointed former Chief of Staff Hulusi Akar as defence minister.